Last week, I gave a talk at the Groupon weekly GeekFest event titled "Smalltalk MVC Applied in Rails". Though the talk briefly touched upon Smalltalk's original MVC pattern and how it is applied in desktop development, the main focus of the talk was on decoupling views from controllers in Rails the way they are decoupled in Smalltalk MVC, so I would like to elaborate more on that in this blog post. 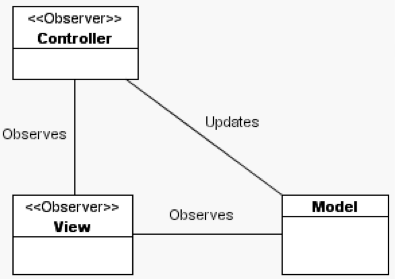 The diagram above shows the relationship between Model, View, and Controller in Smalltalk MVC with desktop development. The View refreshes itself automatically from the appropriate models it is providing a view of. Notice that nowhere in that flow does the Controller directly interact with the View to update it with Model data. In fact, well written desktop applications avoid that sort of coupling to ensure clean separation between control flow and presentation logic. Now, if we were to transfer all of these ideas transparently to the web, View state is simply the parameters (request or session) that are populated by user actions. Controllers get access to them temporarily on user actions to cause updates in Models, but then once they render a View, the View itself can be responsible for translating its state (parameters) into Model objects via a Presenter layer. The Presenter layer in Rails is nothing but the good old (badly named) Rails Helpers. They automatically get access to the View context (request and session parameters), allowing them to act as Adapters that neatly hide the details of converting request and session parameters into Model objects the View can rely on to render its contents. This frees Controllers to focus only on Model updates and routing control logic, avoiding the typical clutter with Model loading logic that we often see in Rails applications. This then decouples the Views from Controllers the way they are in original Smalltalk MVC. Unclutter Controllers from data loading logic for multiple objects that the View needs, allowing each part of the View to load its data directly. Make View partials easily reusable as they rely on Presenters/Adapters (Helpers) to load their data by pull instead of having to include code in every reusing Controller to push the data into the Views. Easily test-drive and maintain the logic of Presenting/Adapting View data in small cleanly separated methods instead of having that logic all mixed in Controllers. When Models needed for the View have dependencies in their load order, there is no need to explicitly order their loading in the Controller. Helper methods can be composed of other helper methods, resolving the dependencies automatically. Avoid the dissonance in View code caused by a mix of "@object" references and Helper "object" references. All objects in the View get populated from Helpers with "object" references or directly from model classes making the code more readable. Trivial extraction of partials from Views given that they do not contain any "@object" variables and all references are "object" references. Developers thus do not need to put any effort into error-prone switching of "@object" variables into "object" locals. The helper "object" references can already serve as locals. Controllers already have access to the context of Presenters (Helpers) thus are able to reuse the View data loading logic without need to duplicate. These are some of the benefits experienced in my last three Rails projects, giving the team great flexibility in maintaining Views, Models, Controllers, and Presenters without the mix of concerns typically experienced in Controllers, allowing for much easier test-driven development and flexibility in composing/modifying features for customers. p.s.2 Though "before_filter"s in Rails can be used to easily load data in controllers. They still put the onus on the controller to do the data loading by push, requiring developers to add such logic to every controller that will reuse a particular View partial, and adding complexity to reasoning about the code. Since erectors views are full ruby objects, this would support this new mvc approach even more. Pretty cool. If it proves itself practical enough, it could become an alternative to Haml. I like the idea presented here but I've seen so much 'view-pushing' code in controllers that it seems very unnatural to see views essentially taking care of themselves. Perhaps the mindset of most traditional Rails developers is that views are not really there to be re-used -- models and controllers are -- therefore views should b just very 'thin' throwaways? Better not to put too much logic in there. But I can definitely see great applications of this idea. During your talk I was thinking about a story I was working on where we needed to enable/disable certain options in a pulldown based on a model's state -- all of that logic was in the controller which felt wrong. It would have been cool to put all that stuff in the views or within helpers used by the view.